Home - Our #StyledByMe winners for 2018! The results of our 2018 #StyledByMe winners are in, and the news is out! After more than 600 entries poured in, our guest judge and celebrated interior designer Sophie Robinson had one heck of a job on her hands choosing the winners. But she pulled through (as we knew she would! ), and picked one winner from each of Anglian’s four regions, plus a national winner. Needless to say, we’re pretty impressed with their eyes for style. From shelfies to lounges, bathrooms and bedrooms, this lot of chic winners has it all. Read on to see what impressed Sophie about their entries, and what their next moves are in the interior design world! 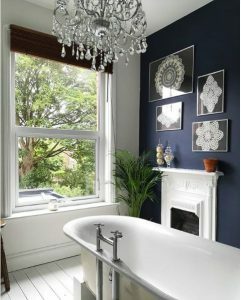 Sophie Robinson: “I totally love the image of this bathroom. I can put myself right there, relaxing in the bath looking at the wonderful view out of the window. Sam Grech: “As an aspiring interior designer and stylist, it’s an absolute honour to have been chosen by Sophie Robinson – an idol of mine – as the regional winner in the North for Anglian’s Styled By Me competition. I’ve been renovating my home for just over a year and I’m really proud of the bathroom, which has undergone a massive transformation, so it’s amazing to hear that it is actually award winning! The framed crochet were made by my Maltese grandmother whom I wished to give tribute to. 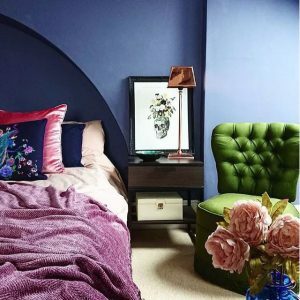 Sophie Robinson: “This room was a winner for me as it has such a strong, uncompromising and original sense of style and colour that I really applaud. 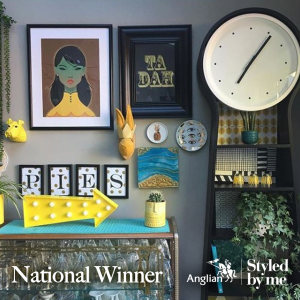 Tania James: “It’s amazing to have been selected by Sophie Robinson as regional winner for London North and East Anglia in Anglian’s Styled By Me competition. Our home is literally busting with colour, and I do have a thing for pink! 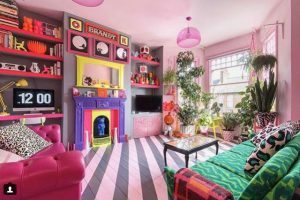 The kaleidoscopic living room is very individual – from the painted floor to the purple fire surround – and it’s been a labour of love creating this space. Sophie Robinson: “This is a personal favourite of mine, as it’s a masterclass in how to style up your open shelves. Sam Bramley: “I was thrilled when I found out I had been picked as the regional winner in the Midlands and South West for Anglian’s Styled By Me competition. Art and interiors are a huge part of my life; and I love sharing my home projects – and all things creative and inspirational. Victoria Goane: “My home really is my passion – the property itself dates back to 1867 and it gives me so much inspiration. 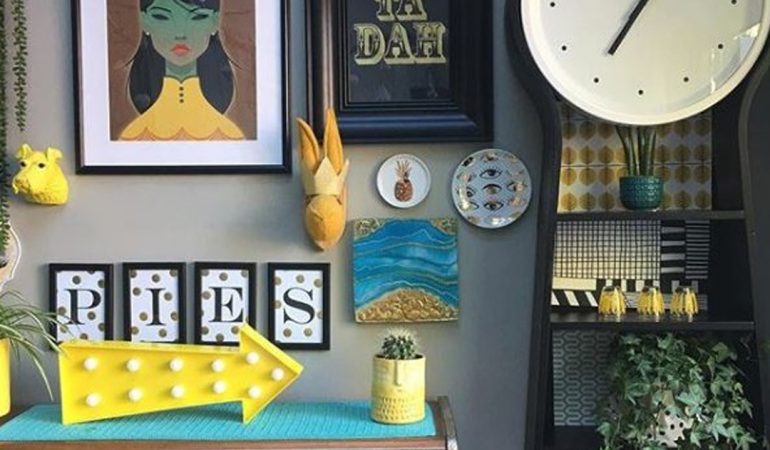 I get so much out of sharing photographs and updates on my home, both through Instagram and my blog “House With The Yellow Door”, so when the opportunity came along to enter Styled By Me, I jumped at the chance! 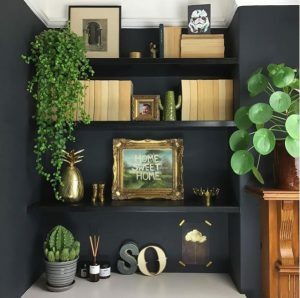 Sophie Robinson: “Sometimes the simplest ideas are the best, and I was really impressed by the sophistication of this display area in Soozi’s home. Soozi Danson: “I was completely thrilled when I found out I had been picked as the national winner for Anglian’s Styled By Me competition. Interior design is such a huge part of my life; I love creating a strong statement with pattern and colour, and my home is a reflection of this. I’m really proud of the very individual interior scheme I’ve created and I enjoy sharing photographs of Insta-worthy corners of my home on social media and on my blog thepatternedpalace.co.uk. Want more from our Styled By Me winners or other similarly stylish interiors bloggers? Keep your eye on this space for future posts from design lovers around the web!